Summer is such a special time in Antigonish and at the store. We’re enjoying lots of visitors from near and far who venture here as tourists, students and even actors. 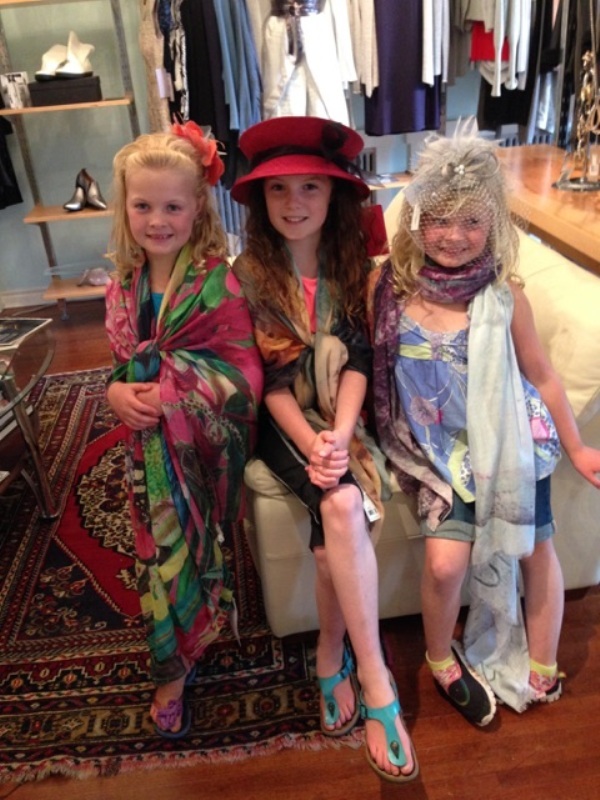 Twins and their older sister showing their mom how to rock some fashion. So much is going on this summer! John Graham Pole and Dorothy Lander performed on our front lawn an excerpt of their new play (Un)settling Antigonish http://www.artshealthantigonish.org/2015/04/1784-unsettling-antigonish/And be sure to take in a performance or two at Festival Antigonish http://festivalantigonish.com/ Thanks to cast member Mauralea Austin for making Aphrodite look so good! The Coady International Institute at StFX is starting their new term with students from around the world. We welcome them! Summer is the season for weddings, concerts, celebrations and good times with friends. We are wishing you a good one! Come on in for a visit and a cup of tea with us anytime! Most of our spring and summer merchandise is now marked down from 20% to 50% OFF the ticket price. We’re making room for the early fall collections that are beginning to trickle in just before the tsunami hits. You will see some lovely new pieces from Eva Varro, Eileen Fisher, Sympli and Bodybag. And we have fresh new shipments from Yoga Jeans and Lisette. Feast your eyes on sparkly new jewels from Karley Smith and bold statements from TwoA. It’s looking good at Aphrodite!